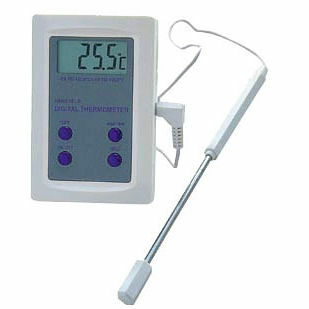 The Compact Professional Food Thermometer is built with a stainless steel penetration probe. It features a reliable and flexible memory that is capable to store the most recent measured temperature. This device is further provided with 0.1°C resolution, and 1 x 1.5 V AAA battery. It also has a measurement range of -50 °C to +200 °C with measurement accuracy of ±1°C from 0 to 100°C and ±2°C above. In addition, all parts of this device is equipped with a 1 year warranty.